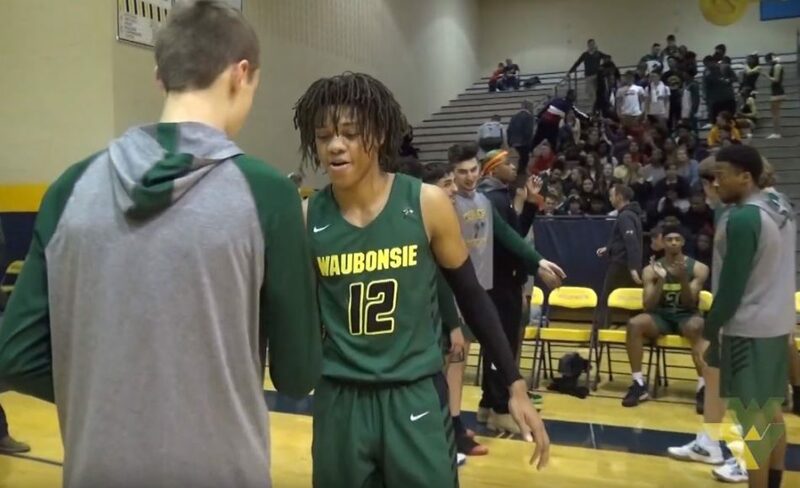 NAPERVILLE – When it came to the rematch of the district rivalry with Neuqua Valley, Waubonsie Valley head coach Jason Mead wanted to treat it like just another game. However, it was anything but another game, as the Warriors’ 55-38 win over the Wildcats on Friday night turned out to be the team’s 20th win of the season. Derrien Porter was the hot shooter of the night, tallying 18 points, including four three-pointers. Marcus Skeete followed with 12 points. Defense may have been the main highlight of the night, however, as the Warriors held the Wildcats to just two points in the 2nd quarter, both of which were free throws. It’s the 11th time in school history that boys basketball has won 20 games in one season, and Jason Mead is the 4th head coach to reach that mark. Steve Weemer did it three times, Dave Saurbaugh did it six times, and Spike Grosshuesch did it once. The Warriors improved to 20-3 on the year and 4-2 in the DuPage Valley Conference. Waubonsie travels to Oswego on Tuesday to take on the Panthers.